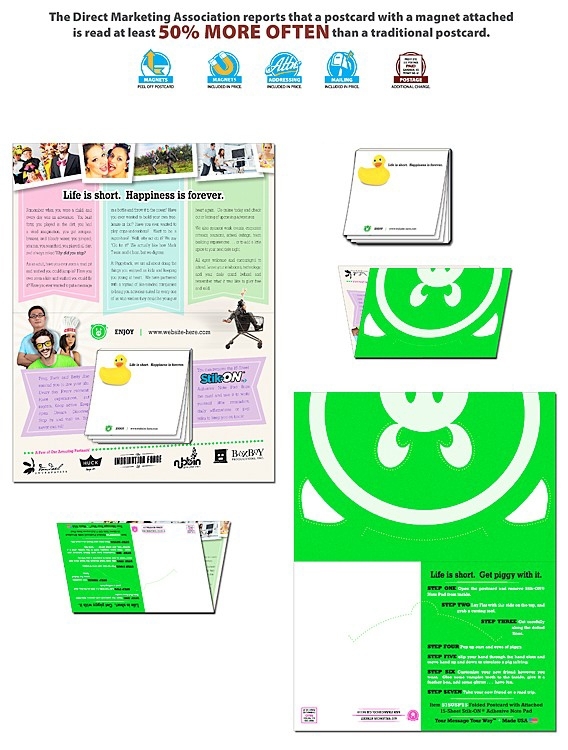 Folded post cards with attached 15 Sheet 3 inch X 3 inch Sticky Note on the inside give you extra impact in your direct mail (or bulk mail) marketing. Postcard is 8.5 x 11 flat, 8.5 x 5.5 folded. This 8 pt. postcard is UV-coated on outside. Price includes printing in full-color (four color process) on both sides of postcard, adhering 15 sheet Sticky Note inside, gluing shut, inkjet addressing. Exact color matches, metallic or fluorescent colors cannot be printed in full-color (four color process). Postage is extra. Postcards are not automation compatible.